A page from the 1934 scrapbook of newspaper clippings from the Arkansas City (Kansas) Traveler, dated December 15th, 1934 . The scrapbooks were created by local Red Cross volunteers. Articles during the Depression years covered food and other relief efforts, and documented unemployment issues. 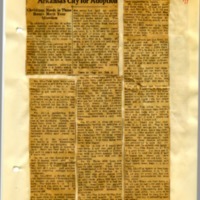 Arkansas City (Kansas) Traveler, “1934 Red Cross Scrapbook: page 71 - December ,” Digital Arkansas City, accessed April 24, 2019, https://arkcity.digitalsckls.info/item/120. In addition to the list of unfortunate families published in Friday’s Traveler other groups that need adoption are being listed today for the consideration of those who wish to bring Christmas cheer into homes where there is no other prospect. five years has had no steady work. In spite of this, five of the children have been kept in school. Two are under school age. The mother and father are hard-pressed to make the tiny food budget ward off starvation. No. 26—In this family there are boys, 2, 5, 8, 10 and 13 years old, a girl 11 years old and a baby boy 6 months old. No. 27—This is a family of seven, a girl 7 years old and boys 2, 9, 14 and 17 years old. No. 28—This family is outstanding for the effort they have made to help themselves. The father is a cripple. The eldest boy is ill. One boy is in school and another is under school age. All are hopeless about doing much for the youngest who is hoping for a merry Christmas. No. 29—Four little boys under 12 years and a girl little older are five members of a family of ten hungry for Christmas fun. The mother is not well and is overburdened. No. 30—The father of this appreciative couple is ambitious and willing to work at anything but help is needed for the little girl, 3 years old and a 6 months old baby. er is ill with tuberculosis as is one of her brothers. Concha was born here, goes to school, and hopes to be a good citizen. She and her brothers and sister look forward to Christmas with an anticipation which may result in sadness. No. 32—At the present time this family is very discouraged for the father has irregular employment and a baby is expected soon. There are four boys, 4, 10, 12 and 14 years old. and a sister 6 years old. No. 33—In this family the mother is young, small and frail. Her daughter of 6 years is helpful. There is a bright and carefree boy of 2 years—and another baby is expected, perhaps before Christmas. and 14 and the girls 5 and 10 years old. The baby boy is 6 months old. No. 35—This family manages the essentials on a small income but there is no money left for other things. A good dinner Christmas cheer are indicated. No. 36—These two elderly people were born and reared in the old South. They were sweethearts in Virginia, were married in Kentucky and came to Kansas as pioneers. They reared a large family but the children have large families of their own and are unable to help the parents who are baffled and wistful about the hard times. The mother, who is 67, pieced a quilt for every year of her life since she was 11 years old, until a few years ago when rheumatism interfered. Christmas cheer and a visit will help. No. 37—Mr. A. lives all alone, apparently having no relatives or well-to-do friends. He doesn’t mind living alone because he doesn’t want to bother anyone. On Christmas Eve he sings carols to himself but on Christmas Day he is lonely. Any little thing will make him happy. No. 38—A boy of 5 years and two girls, 3 and one and a half will be looking forward to Christmas with so much anxiety that it is hoped that they will not be overlooked. No. 39—Three little boys and two girls, attractive and clean, are in this family. Their father is unemployed and has been for a long time. Their mother is a jolly sort who plays games with them and tells stories. She used to take them places but now she can not as the result of a bad accident. Sometimes the parents are discouraged but the children are looking bravely forward to Christmas. No. 40—The father in this family is sick and unable to work. The mother has taken his place on the work-relief program. They are not embittered and make a game of trying to make ends meet although they are used to better things. No. 41—A Christmas dinner would bring happiness to this family of three adults. No. 42—The woman has a tumor and must remain in bed most of the time. The boy has a cancer. The man has been out of work for over a year. The woman likes to read and would appreciate magazines or books. 15	years old. The mother died several years ago and the father is keeping the family together although he has had no steady work for three years. No. 44—The father is in poor health and unable to work. The mother is trying to care for the family of six boys, 2, 5, 8, 12, 14 and 16 years old. No. 45—There are two boys, 11 and 15 years old. The father earns a small amount each week, only enough to buy a little food. No. 48—There are four children, 5, 7, 9 and 11, in this family. They were deserted by their mother and the crippled father is unable to care for them. A grandmother and uncle help but more must aid if Christmas is to be merry. No. 49—The father has been unemployed for some time but the mother has been able to earn a little and relatives have helped. The boys are 3 and 8 years old and the girl 7 years old. No. 50—There are four children, 2, 5, 8 and 12. The father has seasonal occupation but has been out of work since last fall. No. 51—The mother and infant daughter were deserted by the father. The grandparents, both suffering from chronic ailments, are attempting to care for the woman and 18-months-old baby. 17	years old. There are twin girls 6 and a week old baby boy. The father has tuberculosis and must spend some time at a sanatorium . No. 53—The father of this family of seven children, 3, 4, 7, 10, 12, 14 and 17 years old, has not had steady employment for over two years. No. 54—There are four boys, 2, 10, 13 and 15 years old and a girl 4 years old in this family. The father has tuberculosis and the mother and oldest boy, who is in school, have tried to care for the others. One boy is attending open air school. No. 55—This is a family of five, needing nearly anything that can be given. No. 56—The father has not had steady employment for several years. The boys range from 7 months to 3, 7, 9 and 12 years and the girls are 5 and 7 years old.